Shanghai's air quality index will be between 120 and 140, or slightly polluted, on Wednesday morning. By the afternoon, the index will rise to 160-180, or moderately polluted. Shanghai's AQI will rise to 160-180, or moderately polluted, on Wednesday afternoon. Shanghai will encounter a round of air pollution starting from Wednesday under the influence of a cold front from the north. The situation is expected to last till the end of the week. 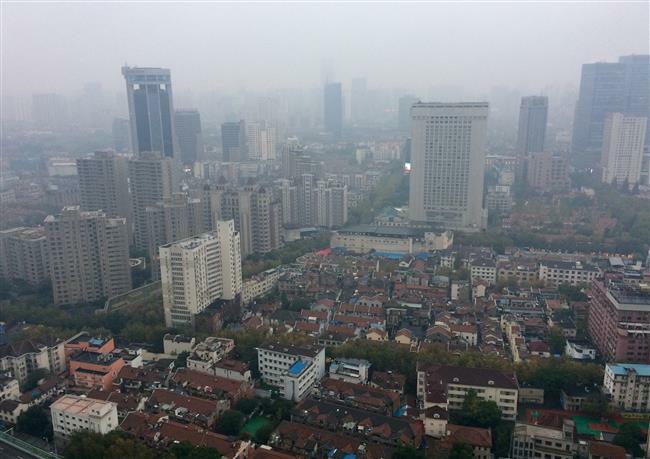 According to Shanghai Environmental Monitoring Center, Shanghai’s air quality index (AQI) will be between 120 and 140, or slightly polluted, on Wednesday morning, with the tiny and hazardous to health PM2.5 particles being the major pollutant. By Wednesday afternoon, the AQI will rise to 160-180, or moderately polluted. Short-time heavy pollution (with the index surpassing 201) can be expected in some areas. “The Yangtze River Delta region has been having poor diffusion condition since Tuesday, so there is already some accumulation of local pollutants,” an official at the environmental monitoring center told Shanghai Daily. Thursday and Friday are forecast to be mainly slightly polluted with the average AQI falling between 70 and 110, though short-time moderate pollution can still be expected as the Yangtze River Delta region will still be under the influence of high atmospheric pressure. A light cold front will bring Shanghai’s lowest temperature from Wednesday’s 10 degrees Celsius to 7 on Thursday. The highest temperature will be 12 degrees on Thursday and 14 on Friday. According to Shanghai Meteorological Bureau, some drizzle is likely on Wednesday. Thursday and Friday will be sunny. Saturday and Sunday will be overcast and cloudy.